This recipe for Lemon Blender Pie is a makeover of, and a departure from, the sticky-sweet of Lemon Impossible Pie. My aim was to make it gluten-free, dairy-free and lower in sugar. Today I would have loved to sit down to a slice of Lemon Blender Pie and a letter from my grandmother. Though I don’t receive letters from her anymore, I have a book filled with my grandmother’s handwritten notes that I keep close to my heart. My grandmother had the habit of jotting down “keeper” recipes and neatly taping food-related newspaper clippings to the pages of her 1956 edition of Betty Crocker’s Picture Cook Book. After doing this for over half a decade, she left quite the culinary time capsule. This week as I delicately leafed through the pages of the cookbook, I found my great aunt Fern’s recipe for pumpkin pie that included a stick of butter! I also found a recipe for Lemon Impossible Pie. Remember that one? 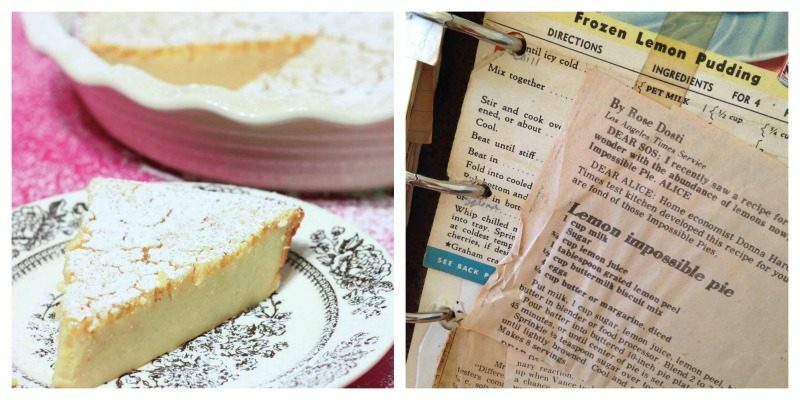 My Tutu—that’s what I called my grandmother—made it often and, girls, was it tasty—a bit over-the-top-sweet, but lemony-tart and custardy good! I think “upside-down lemon bar” comes close to describing it. 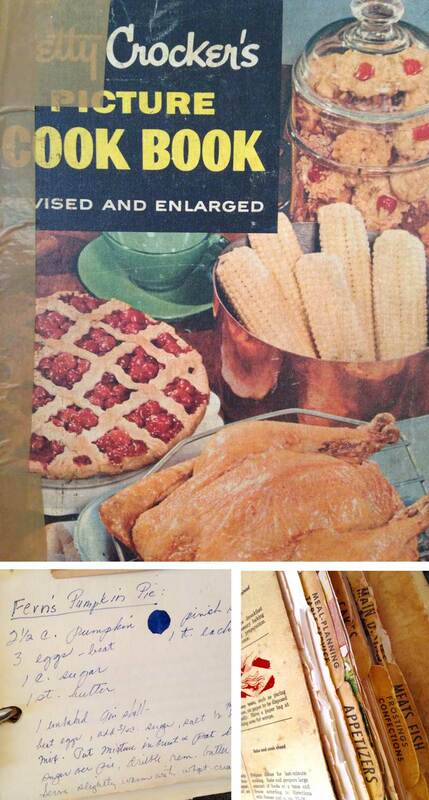 Recipes for Impossible Pies began appearing in print in the late 60’s. They were called “impossible” for the miraculous top “crust” that formed while baking. Food history buffs can read on here. My husband complains that I never make the same thing twice. I just love playing with recipes and transforming them. And that’s what I did with Lemon Impossible Pie. 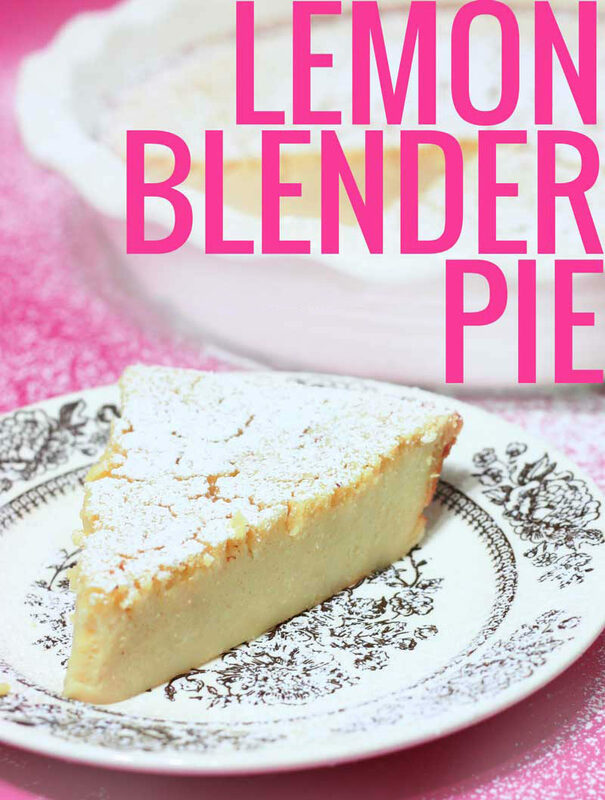 What is a Lemon Blender Pie? This recipe for Lemon Blender Pie is a makeover of, and a departure from, the sticky-sweet of Lemon Impossible Pie. My aim was to make it gluten-free, dairy-free and lower in sugar. I opted to use maple syrup and stevia as the sweeteners, and because of the addition of the liquid sweeteners, I felt I should “up” the flour. To my surprise I actually landed on something quite good! I would use “crepe-like”, “Dutch baby” and even “cheesecake-ish” to describe this Blender Pie. It makes for a not-too-sweet dessert or brunch-time goodie (I’m thinking Christmas morning). I hope you love it as much as we do! Happy holidays my sweet friends. Preheat oven to 425F. Grease a 9-inch round pie plate. Blend all ingredients for 2-3 minutes using a blender or mix well with an electric mixer. Pour into prepared pie plate and bake for 15 minutes. Reduce heat to 325F and bake another 40 minutes. Serve slightly warm or make ahead and chill and serve. I buy pure maple syrup from Costco or Sams Club where it's a great deal. The brands I recommend are ones I use and highly recommend. I have an old cookbook that was my grandmother’s that looks very much like yours — full of handwritten notes in pretty cursive and recipes collected from other sources. It’s such a treasure trove of memories and makes me feel very close to her, even though she passed away this year. Holiday seasons really make us think fondly of loved ones who are no longer here with us in person, don’t they? I’m glad to see you posting again, Lexie! I hope you and your family have a wonderful Christmas.